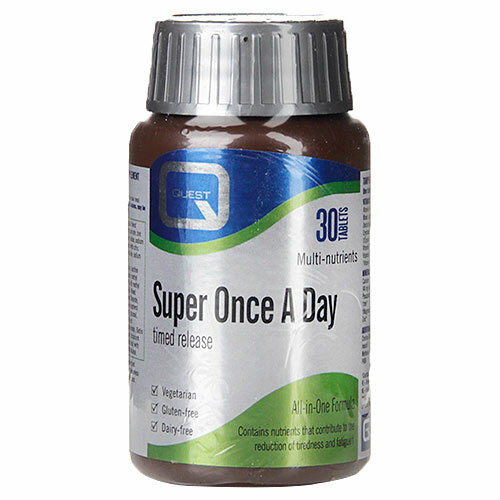 Quest Super Once A Day is a full spectrum high potency vegetarian multivitamin and mineral formula containing ideal levels of iron and zinc and plant source antioxidants. Contains only amino acid chelated minerals for maximum bioavailability. Timed release formula ensures that water soluble nutrients are available to the body throughout the day. Why use Quest Super Once A Day? Dicalcium Phosphate, Multimineral amino acid blend (providing calcium carbonate, magnesium oxide, ferrous sulphate, zinc oxide, manganese carbonate, copper sulphate, potassium iodide, sodium selenite, chromium chloride, sodium molybdate complexed with citric acid, glycine, rice flour, rice protein complex, sodium hydroxide, sodium citrate, aspartic acid and maltodextrin), Vitamin C (with hydroxypropylmethylcelulose), Hydroxypropylmethylcelulose, Lecithin (soya) Vitamin E (soya), Pantothenic Acid, Vitamin B6 (with Methyl Cellulose), Riboflavin, Niacin, Choline Bitartrate, Thiamin (with methyl cellulose), DL-Methionine, Inositol, Para-Aminobenzoic Acid, Mixed Carotenoids (with ascorbic acid, maltodextrin) Magnesium Stearate, Citrus Bioflavonoids, Lysine HCl, Beta-carotene (with D-a-tocopherol (soya), sodium ascorbate, ascorbyl palmitate, corn starch, glucose), Vitamin A (with antioxidant: tocopherols (soya) and tricalcium phosphate), Betaine HCl, Vitamin B12 (with dicalcium phosphate), Biotin (with di-calcium phosphate), Vitamin D3 (with Arabic gum, tricalcium phosphate, D-a-tocopherol) (soya), Papain, Rutin, Cysteine, Folic Acid (with dicalcium phosphate), Glazing agent: Hydroxypropylmethylcelulose. This product contains iron which, if taken in excess, may be harmfull to young children. Keep out of reach and sight. Long term intakes of this amount of B6 may lead to mild tingling and numbness. Do not take if you are pregnant, likely to become pregnant or breastfeeding except on the advice of a doctor as it contains vitamin A. Below are reviews of Super Once A Day Timed Release Multivitamin - 30 Tablets by bodykind customers. If you have tried this product we'd love to hear what you think so please leave a review. I am no longer able to find these vitamins in my local H&B so I am pleased that I can order these from yourself. I only like time-released vitamins as esp for the water soluble (e.g. Vit C and the B complex) these go out quickly and your make seems to only have them time-released and esp for the B complex, at high enough levels to make it worthwhile to take them. I just wish you would also incorporate Vit K1 and Vit K2 as I do not like to eat the greens that these vitamins are found in. I've been taking these daily for many years (can't get them in the local health food shop any more, but bodykind price is better anyway!) - I think they help me feel much younger than my 63 years. Best multi vitamin and mineral tablets I've ever had, my nails were always breaking and these tablets have fixed the problem. Been taking these for many years and I think they help to maintain general health and make up for many nutrients missing from the diet. I still feel much younger than my real age of nearly 62! I have taken this product for over 25 years. Surely that speaks for itself. So glad to find these, as local health food shops no longer stock them. I've been taking these for years and find the wide range of ingredients great for maintaining general health and wellbeing. 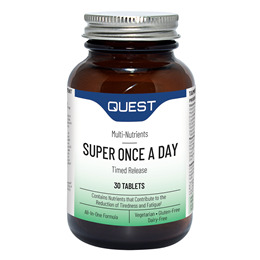 Quest Super Once A Day Timed Release Multivitamin is a high potency vegetarian multivitamin and mineral formula containing ideal levels of iron and zinc. Timed release formula ensures nutrients are available to the body throughout the day.